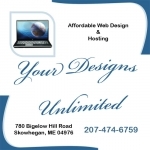 Your Designs Unlimited provides Web Design and Hosting. We offer affordable websites for every type of business small or large. No matter what your needs are, we will work with you to make it what you want.Your Designs Unlimited provides Web Design and Hosting. We offer affordable websites for every type of business small or large. No matter what your needs are, we will work with you to make it what you want.